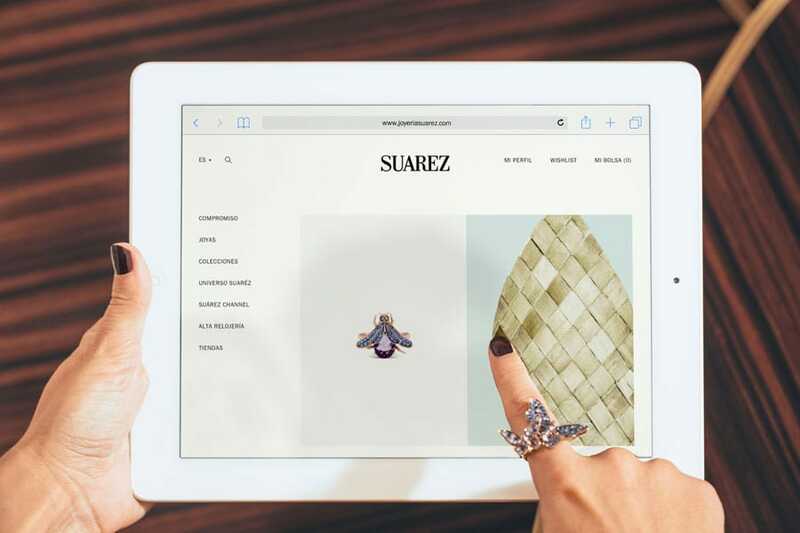 These Specific Conditions of the Purchase Contract apply to any online sales carried out on the website joyeriasuarez.com (hereinafter referred to as the Online Boutique) owned by Suárez S.L. (hereinafter referred to as SUAREZ). Suárez S.L. is a limited company with registered address at c/ Gran Vía 40 bis 3, 48009 Bilbao, holder of Tax Identification Number [NIF] B 95352936, SUAREZ being one of its commercial brands. In all events, use by the customer of the services offered on the Online Boutique represents acceptance of the Specific Conditions of the International Online Purchase Contract, based on the version published by Suarez at the time of the purchase order. Therefore, it is advisable that the customer reads these Specific Conditions before proceeding with a purchase, along with the general terms and conditions for using the portal. The general terms and conditions for using the portal shall apply to any aspects not foreseen in these Specific Conditions of the International Online Purchase Contract. European countries: Germany, Austria, Belgium, Croatia, Cyprus, the Czech republic, Denmark, Slovakia, Slovenia, Estonia, Finland, France, Greece, Hungary, Iceland, Ireland, Italy, Latvia, Liechtenstein, Lithuania, Luxembourg, Malta, Norway, the Netherlands, Poland, Portugal, the United Kingdom, Romania, Sweden, Switzerland and Turkey. Countries outside of Europe: Argentina, Colombia, Chile, the United States, Mexico, Panama, Peru and Venezuela. The prices of each of the pieces of jewellery and accessories are those listed on the website on the date of the order. Prices are listed for each item including taxes and charges. Shipping costs and any other service shall also be specified and broken down for the customer at the time of placing the order. Any import taxes that apply in the country of residence shall be paid by the customer. The shopping service offered by the ONLINE BOUTIQUE regulated in these Specific Conditions only permits the purchase of products and services by customers over 18 years of age resident in the aforementioned countries. SUAREZ reserves the right to cancel the access account of a customer if fraudulent, speculative or malicious acts are committed while using this service. If considered appropriate, SUAREZ will modify and update items and prices according to the company's trading standards, although such changes shall not affect the products that have been accepted. Before signing the contract, the customer will have access to the information available on the ONLINE BOUTIQUE regarding the procedures that must be followed for the finalisation of the electronic sales contract of products or services. The online purchasing procedure includes the following steps which are referred to during the online purchasing process. 1. Purchase, 2. Details form, 3. Payment, 4. Confirmation, 5. Delivery. SUAREZ will file the electronic document so that it will be accessible to the customer after the Contract has been signed. The contract may be concluded in Spanish, English, Russian or Chinese. Lastly, during the online purchasing process, you will be required to enter the details (e.g. your delivery address) necessary to process and control your purchase (specifically, the delivery of the product and the payment thereof). The billing details used will be those listed in the user's registration information. SUAREZ is not responsible for errors committed by the customer in entering the details provided for the purchase. Thus, the customer must pay special attention when filling out the forms, notwithstanding the possibility of correcting said details after making the purchase, where possible, at the following address: Joyería Suárez c/ Serrano 63, 28001 Madrid, or by telephone if preferred: +00 34 91 781 82 66. If the customer enters erroneous details during the purchasing process and the correction thereof results in expenses, SUAREZ reserves the right to charge the user said expenses or cancel the purchase. Customers of any Suarez product undertake to use the portal diligently and in good faith, to pay the established price and to accept responsibility for the authenticity of the data provided during the transaction. The prices of each of the pieces of jewellery and accessories are those listed on the website on the date of the order and include taxes and charges. Shipping costs are broken down for customers at the time of the order. Payment by bank card: All Visa and Mastercard credit and debit cards are accepted. Payment by bank transfer: The transfer will be carried out from the customer's account to the SUAREZ account indicated on the check out page, and proof of payment must be sent to ventaonline@joyeriasuarez.com. Once the payment has been confirmed by the administration department delivery of the product will be processed. SUAREZ uses the services of a third party to process payments, specifically the PAYMENT GATEWAY services offered by the bank BBVA (online payment gateway, which acts as a virtual sales point terminal). The providers of these services will request specific details from the customer in order to carry out the payment, in accordance with the payment method they offer. Once the payment process is successfully finalised (step 3 of the online purchasing process), the contract will be considered as final and SUAREZ will confirm said contract by email within the following 24 hours. The shipment shall be sent via a courier service, provided by a third party (FEDEX) who undertakes to deliver the product paid by the customer to the delivery address within 72 hours. The period of 5 working days for deliveries within the European Union. The period of 6 working days for deliveries to European countries that do not belong to the European Union, except for customs delays. The period of 5-7 working days for deliveries to Latin American countries, except for customs delays. The period of 5-7 working days for deliveries to the United States, except for customs delays. Neither SUAREZ nor FEDEX shall accept responsibility for any customs procedures that may delay the shipment. If there are any problems in processing the order or shipment, SUAREZ will contact the customer to inform him/her of the situation. The customer may also always contact SUAREZ to check the status of an order or a shipment by emailing ventaonline@joyeriasuarez.com or calling: +00 34 91 781 82 66. Except where, during the online purchasing process, the opposite is expressly established, the shipping costs of the SUAREZ product or service acquired through the Service shall be borne entirely by SUAREZ. The customer has the right to withdraw from the contract within THIRTY calendar days following receipt of the item. In application of the European regulations on consumer protection, personalised objects ordered from SUAREZ by the customer are excluded from the right to withdrawal. In these cases return of the object will not be possible. In order to formalise said withdrawal customers must send the returns form that appears at the end of this section, within the stated term, to the email ventaonline@joyeriasuarez.com, stating their desire to cancel the contract, their details (including their account number) and the details of the contract in question. In the case of refunds, it is the customer's obligation to return the product in its original packaging and in perfect state, via the nearest FEDEX office, within the 14 (fourteen) calendar days following the date on which the customer's desire to cancel the contract was notified to the following address: Joyería Suarez c/ Serrano 63, Oficina 1º, 28006 Madrid. Spain. Once the withdrawal is formalised and the item is returned together with its original packaging, the customer will be refunded the price of the item as soon as possible and at most, within the 14 calendar days following the date Suarez was informed of the customer's desire to cancel the contract. The customer will be refunded all payments received, including shipping costs where applicable (except for any additional shipping costs if the customer selected a delivery method other than the cheapest standard delivery offered by us). Refunds will be sent via bank transfer to the account number provided by the customer in the withdrawal form. Any refund expenses shall be borne by the customer. For the attention of Joyería Suárez, C/ Serrano 63, 28006 Madrid. Spain. SUAREZ offers its customers products and services of the highest quality. Our pieces are made in first-class 18 karat gold, first-class 92.5% silver and first-class 95% platinum. Given the special characteristics of the products and services marketed by SUAREZ in the ONLINE BOUTIQUE, there are slight differences between each product or service due, fundamentally, to the uniqueness and exclusivity of each and every one of the materials and stones used to make them, work that is largely done by hand. Thus, no two SUAREZ products or services are exactly alike and, in any case, it is inevitable that the product delivered to the customer differs slightly from the model shown in the photographs of the purchasing process in the ONLINE BOUTIQUE (even if it were the same). In no case do these differences imply that the products or services are of a lower quality of materials than those described expressly on the Portal. Likewise, the customer is informed and aware that the size of the photographs on the Portal does not correspond to the actual size of the SUAREZ products. Thus, the customer is expressly informed and aware of these circumstances and differences and they may not be the cause for a termination of the Contract. In any event, without prejudice to the stipulations set forth at the beginning of this section, any SUAREZ products purchased by the customer via the purchasing procedure established on the website are covered by the legal guarantee for consumer goods, i.e., their conformity with the description provided on the website and these Specific Conditions. SUAREZ will respond to non-conformity claims within two years from the time of delivery. The consumer must inform the seller of the non-conformity within two months of identifying it. Failure to comply with the aforementioned period shall not entail the loss of the right to make the corresponding claim. Nevertheless, the customer will be liable for the damages resulting from the delay in communication. In any event, the guarantee shall not apply to any damage caused due to improper use, as well as, in general, any damage excluded under existing European Union legislation. Those purchasing SUAREZ products may submit complaints and claims to the following address: ventaonline@joyeriasuarez.com or Joyería Suárez, c/ Serrano 63, 28001 Madrid. SUAREZ shall not cover the cost of deliveries to the after-sales department. Any conflicts arising as a result of this online sales contract shall fall under the competence of the Spanish courts. Spanish law shall also apply (Consolidated Text of the General Consumer and User Protection Act) for any aspects that are not foreseen in this contract. SUAREZ does not belong to any association or organisation that offers an extrajudicial dispute resolution system. All contents (including the graphic design, source code, logos, texts, graphics, illustrations, photographs, trade names, trademarks or distinguishing signs and any other elements appearing on the Portal), unless specifically stated otherwise, are owned exclusively by SUAREZ or third parties. No intellectual or industrial property rights with regards to the Portal or any of its integral elements shall be assigned to the customer, and the reproduction, transformation, distribution, public communication, provision, extraction, reuse, reshipment or use of any nature, by any means or procedure, of any of them is expressly prohibited, except in the cases permitted by law or when authorised by the holder of the corresponding rights. The customer may view and obtain a private temporary copy of the contents for exclusive personal, private and non-collective use on his/her computer systems (software and hardware), provided that such use is not carried out with the purpose of developing collective, commercial or professional activities. The customer must abstain from obtaining or attempting to obtain the contents by means or procedures other than those which have been made available to him/her or indicated for that purpose or those used frequently on the Internet (provided that they do not pose a risk of damage or a risk of rendering the Portal useless). The customer must respect the intellectual and industrial property rights of the Portal at all times, which are held by SUAREZ or third parties. In any event, SUAREZ reserves the right to modify, at any time and without prior notice, the presentation and configuration of the Portal, as well as the General Conditions or the corresponding Specific Conditions. The Service will be permanently available 24 hours/day. SUAREZ informs the customer that anomalies or interruptions in the availability or functioning of the Service due to reasons not attributable to Suarez (technical problems with Internet providers, telecommunications, problems with the customer's terminal, etc.) may produce delays and the purchasing of products or services may take longer.